These lovely apricots would make a very nice addition to any party. The can be used as a vegan tapas, finger food or an appetizer. Tapas sticks or toothpicks to serve. Mix the soy yogurt with the cashew nut butter, chopped or ground almonds and hopped fruit. Add the amaretto or almond flavoring. Season to taste with additional powdered sugar if desired. Gently loosen the long side of each apricot and open as a clam shell. Fill about 1/2 teaspoon of filling in each apricot. Garnish with sliced almonds and a pice of candied cherry. 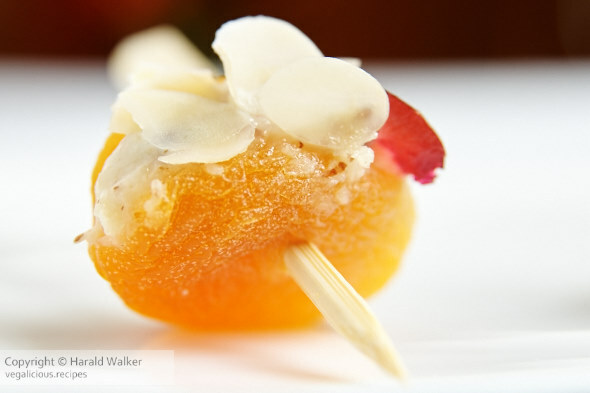 Optionally use a tapas stick or toothpick so people can easily pick the apricots up. Posted by Chris Walker on December 17, 2009 in Appetizers, Apricot, Soy yogurt.